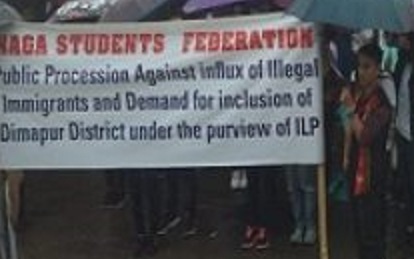 The Naga Students’ Federation (NSF) on Saturday said it was perturbed over the report of stalling of the four-laning work on National Highway 29 from Chathe bridge in Dimapur district to Piphema in Kohima district following regular threats for money, thefts of several vehicles and assault on labourers by miscreants. It appealed to the law enforcing agencies to provide sufficient security for smooth functioning of the project and also demanded necessary investigation into the report of threat and award befitting punishment to the perpetrators. The NSF, in a release, said such act of anti-social elements harassing and threatening the workers was “totally unacceptable”. It reminded that the public and travellers were facing untold hardship due to the condition of the highway owing to ongoing work on the road. Nagaland chief minister Neiphiu Rio called an urgent meeting with top officials of the administration, law and enforcement agencies and the officials of the firm – M/s ECI Engineering & Construction Company Ltd. – involved in the four-laning work in Kohima on Friday to discuss the issue. After the meeting, the company clarified that a particular section of labourers involved in the work were “affected by the incident”. It said all other works such as earth works, highway works and road maintenance were continuing. The firm stated its harmonious relations with all sections of public, local authorities, NGOs, youth leaders, village chairmen and gaon burhas (village headmen) and that all of them were helping it in completing the work. It also lauded the district administration and police for tremendous support and guidance.